Have you considered adding some great entertainment ideas for your event? How about some live music, a DJ, party games, Karaoke, Photobooths, Facepainting…? Well, we know ways to add some fun to your event and nothing beats surprising and engaging your guests. Furthermore, games and entertainment offer an opportunitiy for your businesses to activate your corporate branding e.g. through logo integration and more. Hence we have come up with many ideas in this area. Music is an integral party of most events and we love our music. Whatever music you fancy, our team can provide the best choice of music – for any budget. Party games are another great way to engage your guests and make your event a huge success. The team at Hut Dog event productions has many ideas to suit your location and budget. We`re experts at integrating your brand into the activities. Ask us! Party games – give your guests something to talk about! Photobooths are a great way to engage your guests and give them a lasting souvenir of your event. For corporate events, there are some great branding opportunities. 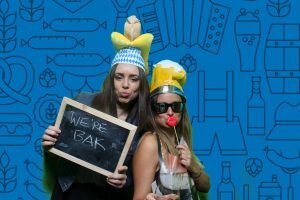 Our photo-booths come complete with props to match your event theme. Furthermore, they use Green Screen Technology so you get to choose awesome backgrounds (e.g. Berlin wall, Munich Oktoberfest or other themes of choice). A custom name/logo and dates can get included on all photo strips and there are graphic and corporate branding opportunities. Additionally, it all comes with unlimited photo prints, social media sharing functionality (e.g. pictures to straight on Facebook). Finally, your guests can receive all your high-quality images on USB. Our services also include the provision of PA systems and Karaoke machines as well as the supply of all other event essentials (such as hire equipment, decorations and more). Contact us about other ideas for your smashing event!